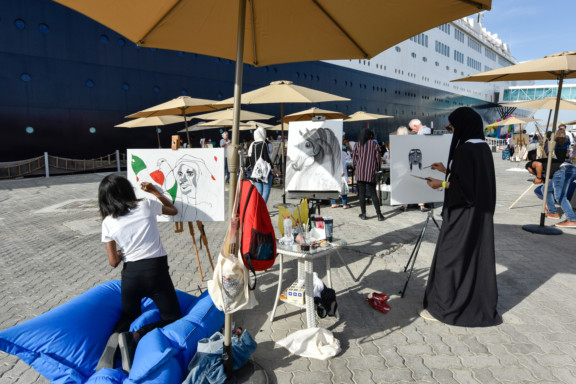 Dubai: The art community celebrated the country’s 47th National Day with 100 artists taking part in a live painting event at the Queen Elizabeth 2 (QE2) ship in Dubai on Sunday. 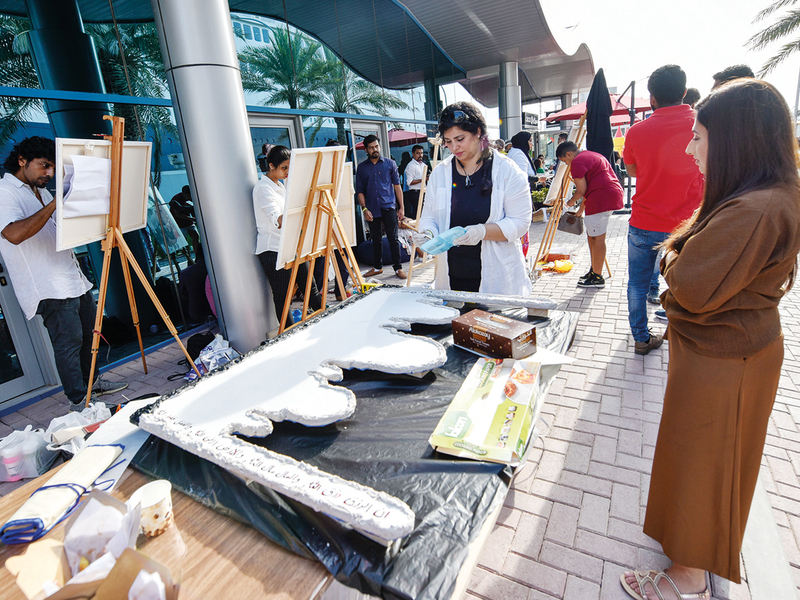 The sixth edition of the National Day Art Festival, was organised by ZeeArts in collaboration with Wathiqati — Hamdan Bin Mohammad Heritage Centre and Queen Elizabeth 2 (QE2). The event’s theme ‘The vision of Zayed’ aimed to commemorate the Year of Zayed and pay tribute to the father of the nation who impacted the lives of many people and spread a message of peace and unity. 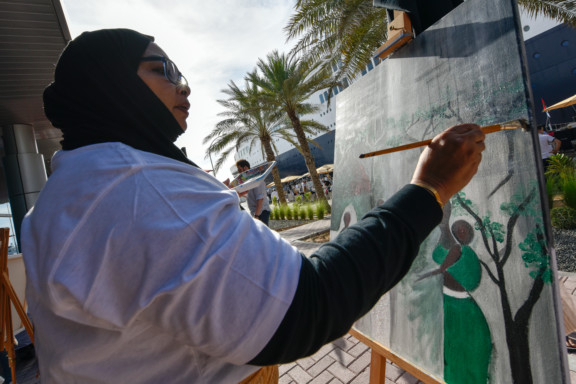 Each artist was given a canvas and challenged to use the four colours of the UAE flag — black, white, red and green to create their own paintings that symbolise the UAE and Shaikh Zayed’s vision. “Shaikh Zayed’s message of unity is what we can see here today, we have artists from all nationalities and backgrounds celebrating this special day as a ‘thank you’ to the UAE,” said Zaahirah Muthy, founder of ZeeArts. The art organisation was first launched on December 2 of 2011, with a UAE National Day event featuring 10 artists. 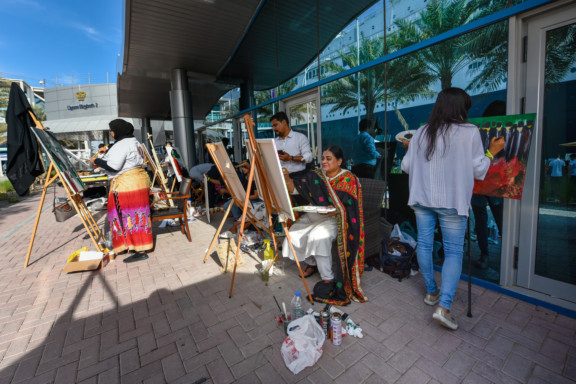 Since then, ZeeArts has organised over 80 events in the UAE and the region with the aim of connecting artists from across the globe and spreading Shaikh Zayed’s message of peace. 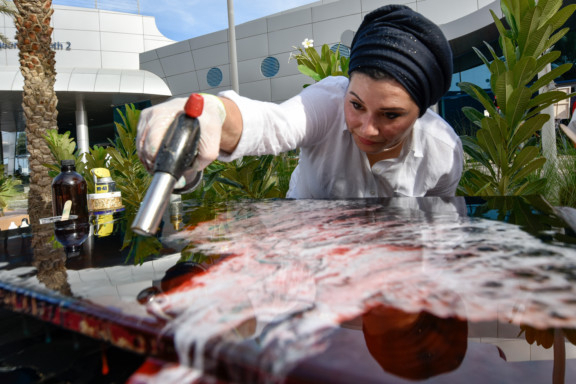 Artist Seren Al Khalaf, from Syria, is an Abu Dhabi resident who has taken part in the National Day art festival for three consecutive years. “To me green symbolises life and white symbolises purity, so I am looking forward to mixing up the four colours and creating an abstract piece,” she said. Al Khalaf, referring to the various nationalities present at the event, said art has brought residents together from all seven emirates to pay tribute to the country they call home. Another participant, Emirati Ahmad Al Awadi from Sharjah, expressed his joy at seeing people from all walks of life celebrating the UAE’s National Day. “You can call Dubai an ‘international city,’ with so many different people and cultures. [His Highness] Shaikh Mohammad [Bin Rashid Al Maktoum, Vice-President and Prime Minister of the UAE and Ruler of Dubai] has taught us to coexist and this event symbolises that message,” he said. The artist of 20 years painted a canvas of Burj Al Arab using the country’s four national colours. 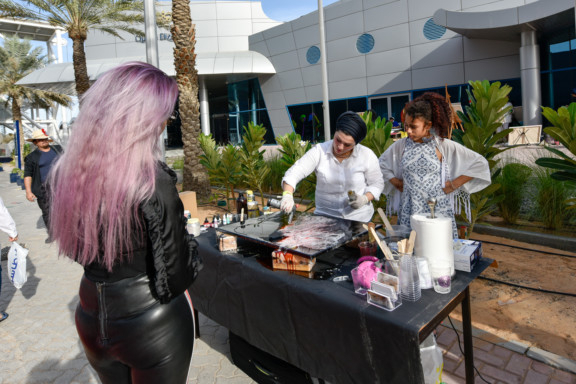 Meanwhile, one of two international artists taking part at the event was Sana Hijri from Belgium, who has visiting the UAE for the past four years to take part in the National Day Art Festival event. Hijri, a member of the Royal Academy of Fine Arts in Belgium, said she admires the art scene in Dubai and will be attributing her abstract painting to the country’s achievements. “I come down to Dubai several times a year as it has a rich art culture and various events that I am not able to find in Europe. I am using the four colours and a modern technique to create my painting today,” she said. 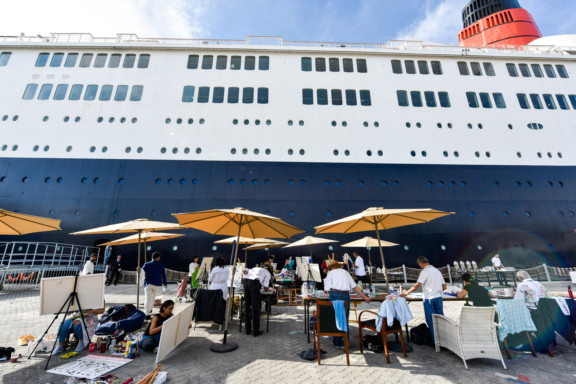 The event took place from 12pm to 5pm on the deck of the world-famous cruise liner. 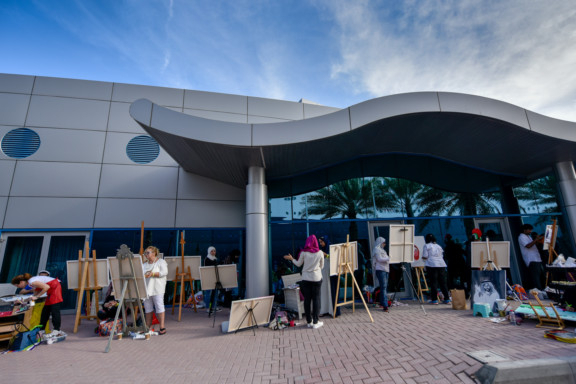 “We are proud hosts of the National Day Art Festival and find it important to be engaged in such culturally connected activities — especially given the QE2’s history as a cultural icon and her location at the heart of Dubai’s cultural and heritage district,” said Russel Hanson, General Manager at PCFC.